Grassholme Reservoir, where there’s still a Portaloo that’s very useful not just for its advertised function but as a brief respite to sort yourself out in bad weather. I camped here on a previous Pennine Way. At this rate in a few years walking the Pennine Way will take me a month if I have to visit everywhere I’ve camped. From this cairn just past Ravock Castle you can see the useful bad weather shelter at Deep Dale. It would be so great if a few more landowners were this kind to hikers. The friendly little tuck shop near Collin Hill, where you can also fill your water bottle. The famous ‘halfway, suckers’ trail marker at the A 66. McFarlane’s finest. Apart from their pork and apple. Final view of Tan Hill. From now on it gets wilder. By the time I’d enjoyed my lavish breakfast the sky was blue over Tan Hill. The distinctly unexciting ‘scramble’, and a good job too as I hate heights. The all weather bridge at Maize Beck. A gamekeeper told me why it’s so high – the previous stepping stones, each the weight of a family car, were simply washed away in a flood. Do not become so hypnotised by the boring track you miss this vital sign off it to High Cup! In the unlikely event anybody wants to install a bench in my memory, I’ll have this one near Langdon Beck. Posthumous thanks. Perhaps the original green roof? High Cup Nick, viewed extensively. 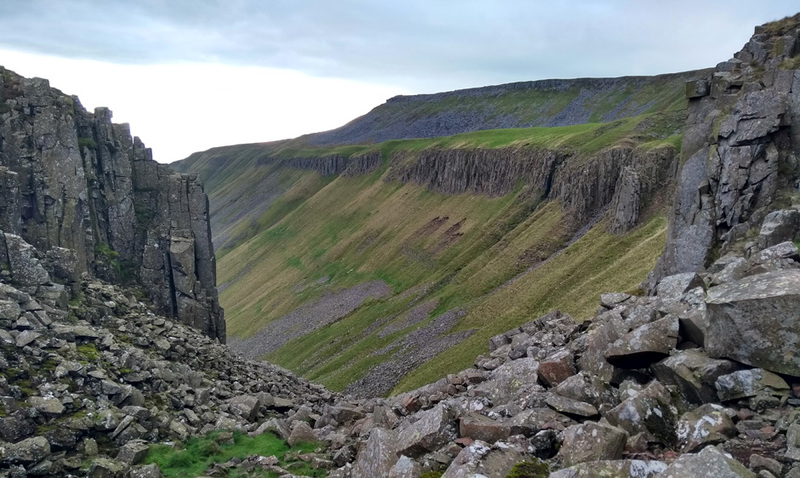 High Cup is (altogether now…) famous for extensive views. The steep climb up to Knock Old man is one of the hardest on the whole Pennine Way, especially in pouring rain. A healthy breakfast was procured from another friendly little trail tuck shop at Bow Hall on the way down to Dufton. Thank you. Looking up to Cross Fell, the last of the clouds lifting.